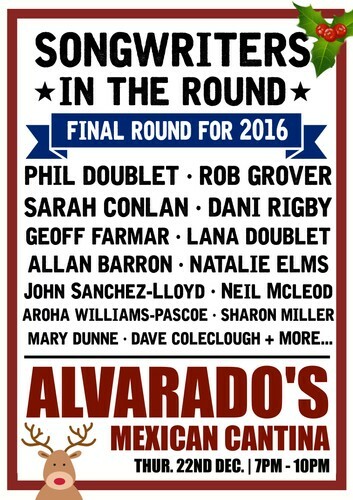 Come celebrate the final Songwriters in the Round for 2016! Songwriters in the Round is an evening where songwriters perform & tell their stories behind the songs. Come share an evening of great music and storytelling with an amazing bunch of musicians! Phil Doublet, Rob Grover, Sarah Conlan Music, Dani Rigby, Geoff Farmar, Lana Doublet, Allan Barron, Natalie Elms, John Sanchez-Lloyd, Neil MacLeod Music, Aroha Williams-Pascoe, Sharon Miller, Mary Dunne, Dave Coleclough and more!